These simple apps offer more productivity power than you'd think. The battle for best note-taking app typically comes down to two combatants: Evernote and Microsoft’s One Note. But these two productivity titans aren’t to everyone’s taste. Fortunately there are some worthy alternatives—some of which may already be on your device—for collecting your task lists, ideas, and other notes. Here are three of the best. Simplenote is the closest an app has come to replicating the simple act of jotting notes on a blank piece of paper. As its name implies, it doesn’t clutter your screen with a lot of icons or buttons, nor does it allow you to attach files or add images to your note. What it does offer is a nice, clean canvas for your ideas, to-dos, and anything else you need to capture in plain text. Simplenote: no frills note taking. Simplenote lets you organize your notes with tags and also maintains version history, so you can roll back to earlier iterations when necessary. The app doesn’t have any hefty collaboration features, but you can share your notes with others. All notes are backed up and synced in the cloud for access across your devices. Free for iOS, Android, Kindle, Mac, and Web. This often-overlooked app in Google’s productivity suite packs a lot of features behind its austere interface. Among the many tricks it has up its sleeve are the ability to convert any note into a checklist, turn images into editable text, and send you reminders based on time of day or your location. 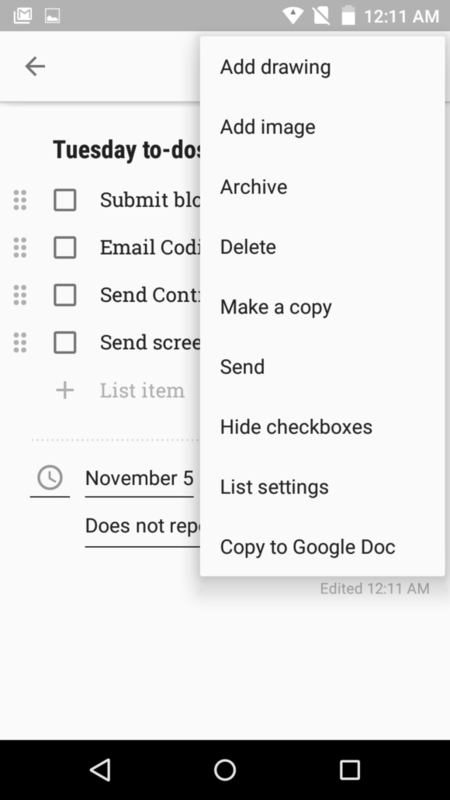 Google Keep can turn any note into a checklist. The winner, however, is its use of Google Now to enable voice-activated notes. Whenever inspiration strikes, just trigger your mic, say “OK Google—note to self,” and dictate what’s on your mind. Despite its appearance, the note-taking app that came with your iPhone or iPad is more than a digital legal pad. As of iOS 9, the app now supports more formatting options, so your notes can go beyond simple lists. 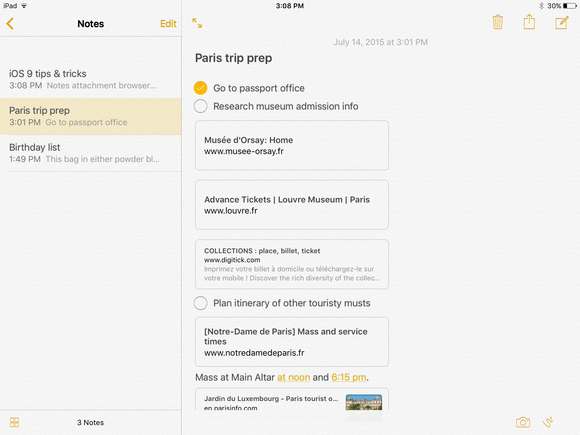 Apple Notes now lets you incorporate content from other apps. But Notes goes beyond text. You can also now draw sketches; take photos and video from within the app; create checklists; and insert documents, maps, and other attachments into notes. And, of course, you can sync your notes across all your Apple device via iCloud.